As part of One Donegal Social Inclusion week 2016, Cllr Terence Slowey, Cathaoirleach hosted a Care of the Aged day in his home town of Ardara. Groups of older people and their carers from Ardara, Glenties and Downstrands were invited to St. Shanaghan House for lunch, a bit of fun and the opportunity to get information on the services provided in Donegal to help older people. The event started off with a tasty three-course lunch cooked by the staff at St Shanaghan house. Cllr Terence Slowey then welcomed everybody to his home town in Ardara and explained his involvement in the Donegal Age Friendly County Programme. A copy of the “Information Guide to Services for Older People in County Donegal” was handed out to everyone in attendance. The Cathaoirleach noted that this guide is available in libraries and public service centres throughout the county. Furthermore, to help prepare for the Winter months ahead guest speakers were invited to come in such as Garda Manus O’Donnell and Garda Elaine Kavanagh who gave a talk on Community Alert and how to apply for the Text Alert scheme. Advice was also given on things to be aware off when living alone and a reminder that the guards will always respond to people’s calls. Hugo Doherty and Stephen McDermott, Glenties Fire Services Department also talked about the importance of Carbon monoxide Alarms, Smoke Alarms and heat Alarms in the home. Frances Browne, Good Morning Service, advised of the supports available through the Good Morning Service such as the Befriending Service which is now being spread through Donegal and is looking to expand into the Glenties, Ardara and Killybegs area. A cooking demonstration was given by a local chef Sheila Sweeney from the Heritage Centre, Ardara. She showed the older people in attendance how to cook a cheap, nutritious yet simple meal to keep them warm during the Winter months. The event was then finished off with a sing song and dance, with live music provided by St. Shannaghens House. 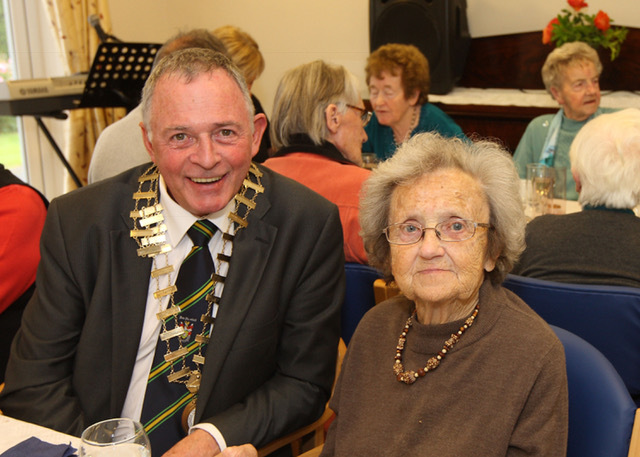 The Cathaoirleach, Cllr Terence Slowey was delighted to host the Mayors Care of the Aged Day in Ardara. A big thank you to Angela McDyre and her staff in St. Shanaghan House for the beautiful food served and the music and entertainment on the day. Donegal County Coucil would also like to thank Garda Manus O’Donnell, Garda Elaine Kavanagh, Hugo Doherty Fire Services, Stephen McDermott Fire Services, Frances Browne Good Morning Service, Sheila Sweeney Heritage Centre Ardara and JMAC Photography for making the Mayor’s day a fun yet informative event for all.